Ahh the warm colors of summer. 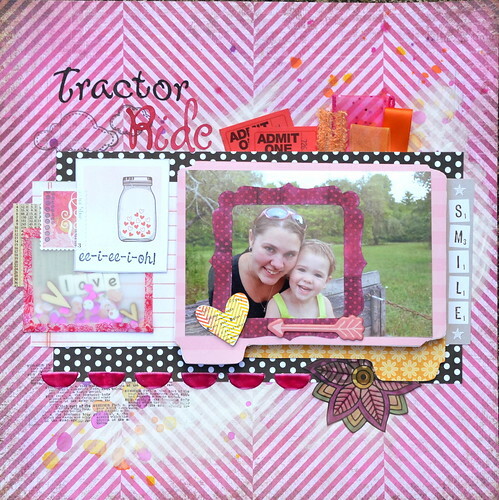 I used this color pallet from Scrap Friends as my starting point for this page. Color challenges are always so tricky for me. I have particular colors that I like to use and have a difficult time meandering away from them. Part of it also tends to be that I don't have colors or hues in my stash that the color challenges always seem to want, but the warm colors was one I actually could make do with. I am so happy with how the little pink polka-dot frame. I traced another frame I had lying around onto some white card stock. Then I colored it with a pink marker. Then I took a polka-dot stamp and stamped all around it. I am so happy with how cute it ended up being. I also found this cute song challenge at Scrap Your Story. I knew I just had to add the ee-i-ee-i-oh. I didn't want to add old McDonald though because it is grandma and grandpa's farm and that would just be too silly. I also made another vellum shaker and this one came out really well. These shakers are starting to become an obsession! I used washi tape to close it off and it worked out really well. I didn't feel like getting my sewing machine out so I'm glad the washi worked out so well. 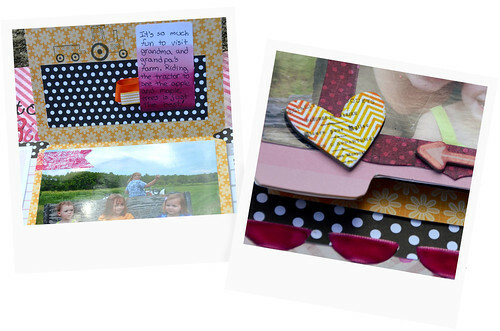 This page has some hidden journaling and another photo that I love from our little tractor ride. I wanted to do a lot more, but my little daughter had a bad tummy bug. 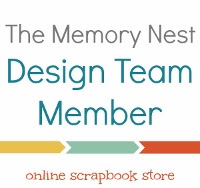 So, I didn't have much time or energy left to scrapbook. 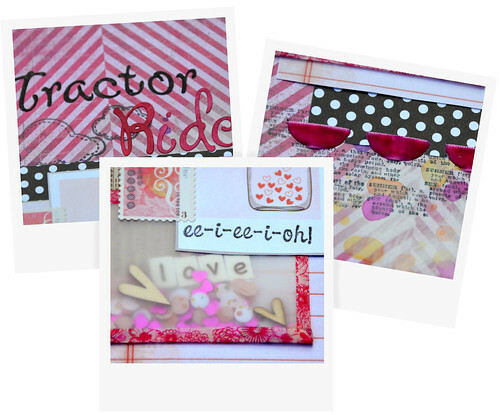 I love the polka dot frame! You did a great job making it and using it. And I see why you like the vellum shakers so much, they are just adorable. I just LOVE this. All the little details are gorgeous and your frame turned out fabulous! Totally love how you incorporated the song lyrics. Thanks for playing with SYS this week! this page is just darling! I love all the pinks and how you framed the photo! thanks for playing with us at SYS! Great use of the colours and I love the way you have framed your faces in the photo. Fabulous page. What a cute page! Love that shaker and the frame. And your song choice is perfect for this page. Thanks for playing along at SYS.